If you are suffering from a problem with alcohol or drugs help is available in Springdale, Arkansas as well as the surrounding Fayetteville and Rogers metropolitan area. It is never too late to make a change. Don’t let alcohol or drugs affect you or your family’s life any more. Today is the day to start a clean slate and begin working towards a happy, healthy, and fulfilling life of sobriety. 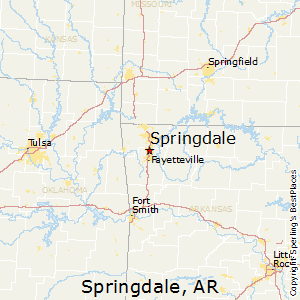 Springdale, Arkansas, known as the poultry capital of the world due to the presence of Tyson foods (the cities largest employer) has experienced a rapid growth in population over the last 25 years. The population has grown more than 133% during that time. Unfortunately the problem of drugs and alcohol has also grown in tandem. Sales of prescription opioid painkillers, drugs such as Vicodin, OxyContin, Roxicodone, Percocet, and Dilaudid, have increased at least 300% since 1999. Arkansas ranks 8th in the nation in prescription drug overdose. Opioid drugs can be particularly lethal in the event of overdose due to respiratory depression, where a user stops breathing and dies from lack of oxygen. Some users believe that prescription drug use is safer because the drug was prescribed by a doctor and manufactured by a pharmaceutical company, but many users will misuse prescriptions. They may take more than the recommended dose, take the drug more often than prescribed, or use the drug in unintended ways such as injecting or “snorting” crushed powder. Furthermore, a rise in counterfeit prescription pills (drugs made to look like genuine pharmaceuticals but manufactured in clandestine labs and often containing an imprecise and unknown amount of other opioids such as fentanyl) can lead to accidental overdose. A progression from prescription painkillers to heroin use is all too common. Users will often find that prescription pill use becomes too expensive as they build up a tolerance to the drug. Opioid use builds a physiological tolerance, meaning that as a user takes more of the drug, they require a higher and higher dose to achieve the same effect. Users may find heroin, often in the form of Mexican black tar heroin in the Springdale and Fayetteville areas, to be a more viable option to feed their addiction. Unfortunately the transition to heroin often involves a change in the route of administration. This means a user may go from taking pills orally to intravenous drug use. The use of needles increases the risk of a fatal overdose due to increased potency of the drug. The use of needles, particularly the sharing of needles, greatly increases risk for serious diseases such as HIV and Hepatitis C. The ramifications of needle use can be lifelong if such a disease is contracted. Prescription opioids and heroin are not the only drugs of concern in Springdale. Arkansas ranks in top ten states in the United States for methamphetamine use and arrest. Methamphetamine is a stimulant drug which increases wakefulness and gives users a sense of euphoria. However, methamphetamine use comes with disastrous consequences such as psychosis, sleep deprivation, heart attack, severe dental problems, and increased high risk behavior including unsafe sexual behavior. Methamphetamine use is extremely addictive. In addition to illicit drugs such as heroin and methamphetamine, a legal drug, alcohol, is the most commonly abused drug in Springdale. Alcohol abuse and addiction can be just as deadly as illicit drug use. Although alcohol is legal it can lead to legal consequences such as driving under the influence (DUI) charges. Alcohol is also a contributing factor in many crimes. Have you had medical problems as a result of your drug use (e.g., memory loss, hepatitis, convulsions, bleeding, etc.)? Following the assessment, the intake process will cover a detailed history of the patient including any existing medical problems. A physical examination may be performed. It is common to also perform blood tests to check for any damage that may have been caused due to substance abuse. Tests of liver function and screening for existing diseases such as HIV and Hepatitis C are common. More specialized tests may be conducted depending on the individual’s situation. Drug screening and breathalyzers are also done at the intake process to determine the level of drug use. An extensive clinical interview will be completed with the patient. This can be a very trying time for the patient as the experience may seem overwhelming. However, it is very important to be honest and forthcoming about any questions that are asked. Addiction is often filled with guilt and shame, but rigorous honesty on the part of the patient will aid greatly in the treatment process. Many people suffering for substance abuse and addiction problems also have problems with other mental illnesses such as depression or anxiety. During the intake process the medical professionals will screen for any comorbid (occurring together) mental health issues. Treating both the addiction and any mental health problems will lead to the greatest chance of recovery. Following assessment and intake the patient will begin the detox process. Depending on which drugs are used the detox process may be slightly different. The point of detox is to safely allow drugs to leave the body in a controlled setting. Certain drugs such as alcohol and a class of prescription pills called benzodiazepines (drugs such as Valium, Xanax, Klonopin, Ativan, etc.) can be fatal if stopped abruptly. With alcohol, delirium tremens (DT’s; colloquially referred to as “the shakes”) may begin approximately two days after the last drink; symptoms of delirium tremens include shaking, increases in blood pressure, fever, and hallucinations. Delirium tremens can be fatal is left untreated. Withdrawal from opioids and heroin is often agonizing for a person. A controlled medical detox can make the process safer and more comfortable. Drugs such as Subutex is often used to transition the patient to sobriety. Subutex (buprenorphine) is an opioid drug commonly used in addiction medicine. By replacing one opioid with another the dose can reduced slowly in a controlled fashion, which will make the process much more comfortable for the patient. Medical professionals will be monitoring patients throughout the detox process to ensure the patient is safe and comfortable. Vital signs will be checked regularly to ensure dangerous changes in blood pressure or respiration are not present. Any medical treatment needed outside of problems of drug abuse or addiction will often begin during the detox process (such as beginning the patient on an antidepressant medication if they have issues with depression). Detox is often performed in a hospital setting or within a drug treatment center itself depending on the facility. The length of detox will depend on the individual, their health, and their drug use; detox may be as short as 72 hours or continue for over a week. Following the completion of detox patients will transition to drug treatment. Depending on the individual (the severity of their drug use and their current life situation) several options are available for treatment. More Q&A on treatment options here. The most effective form of treatment for drug and alcohol addiction is inpatient treatment. Residential treatment centers (often abbreviated RTC) are the gold standard for drug treatment. At a residential treatment center the patient will be exposed to 24 hour care. They will have a regimented schedule of activities, including individual therapy, medical visits, group sessions, education about addiction, music and art therapy, exercise, and recreation to name a few. The person will be living in the treatment center so they will be removed from their previous living situation (where they are often surrounded by drug and alcohol use). Removing a person from the situation they were in while using drugs is often helpful in establishing new, healthier behaviors. The length of stay in a residential treatment center will vary depending on the individual, their situation, and their progress; common lengths include 30, 60, and 90 day programs. The cost of residential treatment centers will vary greatly depending on the facility and the individual’s health insurance. Some residential treatment centers look like extravagant resort hotels with pools and other amenities. The idea behind residential treatment centers is to put the person in the best possible situation for recovery. Residential treatment centers may not be the best option for all individuals. A hybrid or combined approach that contains some elements of the RTC but with more flexibility may be favorable to some people. These hybrid approaches are often called partial hospitalization programs (abbreviated at PHP). In a partial hospitalization program patients enjoy many of the benefits of a residential treatment center, but have the ability to sleep in their own homes. Partial hospitalization programs are often five days per week, up to eight hours per day, of treatment. So far we have discussed residential treatment centers and partial hospitalization programs, both of which provide excellent services for those looking to recover from drugs and alcohol. However, both RTC and PHP usually require a person to have the ability the take an extended period off from employment, child care and other responsibilities. This may not be feasible for some individuals. Outpatient treatment can still provide support while allowing an individual to continue with their responsibilities. Some outpatient programs are described as intensive outpatient programs (abbreviated as IOP). In these intensive programs one will often have daily assignments related to their addiction and will come into a treatment center in the evening after typical work hours. Some facilities provide a step down approach where individuals will start off in the most intensive program they can handle, and then move to less intense programs as they progress over time. There is no right treatment option for all individuals. It is not a one size fits all approach. Depending on the unique situation of each person, a medical professional may recommend a RTC, PHP, IOP, or a combination. Following completion of a drug treatment program aftercare is recommend. Aftercare is the continuation of treatment following successful completion of a RTC, PHP, or IOP program. It is important to stress that individuals are not “cured” after they complete a drug rehab program. Addiction can be a lifelong process. Aftercare provides support to individuals as they re-enter “real life” following treatment. The stress of returning to work, family obligations, and financial responsibilities can be triggers for the recovering addict. Aftercare will provide skill building in relapse prevention strategies, managing anxiety, depression, anger and stress, and help with healthy coping mechanisms. Sober living homes are residences in which people recovering from drugs and alcohol live together as they are transitioning back to a healthy life. Unlike RTC, sober living homes do not provide patient care, instead their purpose is to provide a stable foundation for the recovering addict. Sober living homes will have certain house rules, such as a curfew, work requirements, and daily chores to be completed. Some sober living homes will require random drug tests to prove the individual is staying clean and sober. Sober living can be beneficial to those who do not want to return to the previous living situation prior to treatment. For some, their living situations were contributing factors to their drug and alcohol problem. In a sober living home individuals will pay rent, shop for groceries, cook food, and maintain their living environment just like they would in their own home. Having the support of peers who are going through similar issues can help a person transition back into a healthy and happy life.